About 1 minute and 13 seconds reading time for this 340 word page. So many in Louisiana are suffering because of one person and a small group of people called the Restore Louisiana Task Force. It is one person that doesnt know advising a group of people that arent being told the truth. Waste and Mismanagement. I know the SBA topic is about not counting the SBA Loans as DOB. But that topic has been floating around DC for over 10 years and not a soul has actually addressed the real issue which is SBA itself. SBA feels it has to collect any federal money given after it's loan amount to use to pay down the SBA loan. HUD does not really disagree and gives no guidance on accepted SBA Loans. So the state of Louisiana Office of Community Development thought it would be a good idea to not follow HUD guidance and to keep SBA hands off of the CDBG-DR funds Restore (OCD-DRU) setup their DOB to count your SBA Loan against you thus not losing any CDBG-DR funds to SBA. SBA will take your CDBG-DR Restore money if you have taken a SBA loan and are awarded Restore Grants. No way of getting around this, they (SBA) has the collection process and collection center waiting. 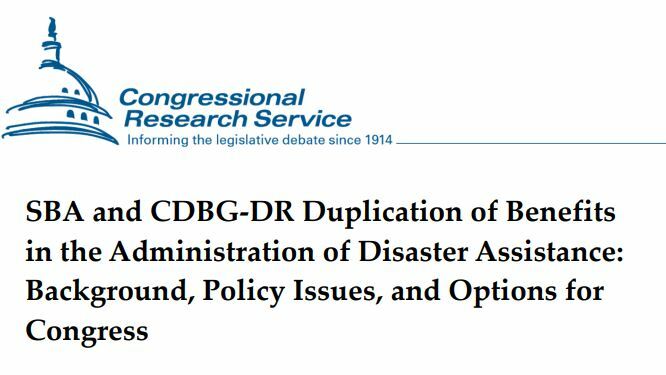 So instead of sending CDBG-DR funds to SBA that will in turn pay down the recipients SBA Loan our Restore Task Force group approved the DOB method that matches no other DOB process in Disaster history. Let me draw the 3 lines the Louisiana Task Force has drawn in the sand. 1. Louisiana Restore will not give CDGB-DR Grants to any household that has been approved for a SBA Loan and is over the LMI threshold. 2. Louisiana Restore will not give CDGB-DR Funds to any household that has an active SBA loan because SBA will collect the HUD CDGB-DR funds and pay down the SBA loan for the homeowner. 3. Louisiana Restore has not followed it's own processes and HUD guidance on the issue since the first Homeowners Manual was published.